Kazan «UNICS» won Kazakhstani «Astana» — 83:79 (17:19, 26:17, 14:27, 26:16). 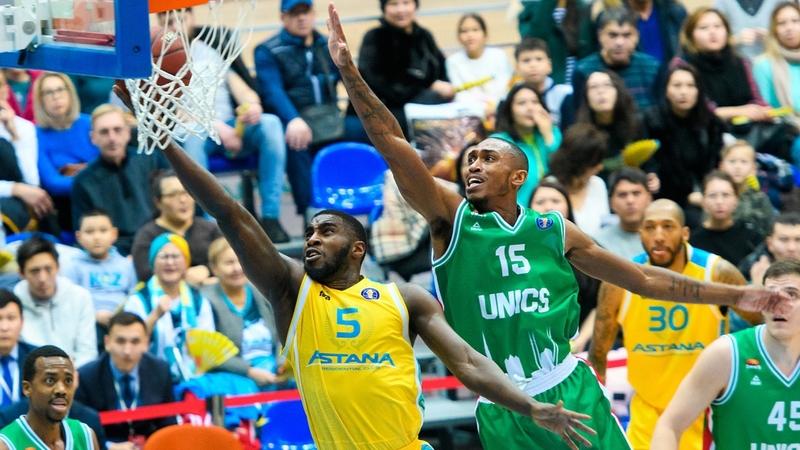 «Astana» (7–4) and one of the Top 3 «UNICS» (9–2) were divided by only one position in the standings. The champion of Kazakhstan allowed the opponent to score only 2 points (8: 2) after five and a half minutes after the start of the game. Losses prevented the hosts from gaining a further advantage, which generally became their main problem in the first half. 13 errors of “Astana” allowed «UNICS» to go for a break with a 7-point gap (43:36) even with the worst field goal percentage (45 vs. 52) — Kazan made 37 shots in a game against 21 for Kazakhstan team. «Astana» made a breakthrough 18: 4 right from the start of the third quarter and returned the lead before the decisive moment in the game — 63:57. UNICS perked up thanks to the Russian duet Yevgeny Kolesnikov — Artem Klimenko (62:63). The game smoothly moved into the ending. The decisive stroke of the tense game became missed free throws. One of the misses (Trent Lockett with a score of 78:79, 23 seconds before the buzzer), «UNICS» players compensated with the attack. Additional possession of «Kazan» was used with maximum benefit: Jackie Carmichael dunk with a foul and the long-awaited throw from the line — 81:79. In the saving attack of «Astana», JJ O’Brien gained the right to two free throws, but he missed both. Kazakhstanis had 13 more seconds left, but they managed to foul only 4 seconds before the end of the game — Jamar Smith did not flinch (83:79). «UNICS» caught up with «Khimki» by the number of victories, Astana has the second defeat in a row. «Astana»: Anthony Clemmons (16 + 7 rebounds + 6 rebounds), JJ O’Brien (16 + 5 rebounds), Michael Jenkins (12). «UNICS»: Erric McCollum (20), Artem Klimenko (16 + 11 rebounds), Jackie Carmichael (9 + 9 rebounds). - First of all, I congratulate «UNICS». Today it has been a very good game, but we let the victory slip from the hands. One lost rebound, in the end, decided the outcome. We must continue to play at the same pace, and we know that we can play even better. There are important games ahead, and we need to be focused on them. - Today it was very hard. During the last 6 days, we played 3 matches and spent a lot of time on the road. «Astana» is having very well this season. I think that both teams deserved to win and the details finally decided the whole game. Congratulations to my players; now we are very tired, and this is a real problem for us. The next matches will be played by the team on its court, on January 14 and 15, «Astana» will host «Barsy Atyrau» basketball club as part of the Kazakhstan Championship among men's teams of the National League. The next match of the VTB United League Astana will be held on the road, on January 20, the capital basketball players will visit Krasnoyarsk, where they will meet with the local «Yenisei» basketball club.